Halfway done! 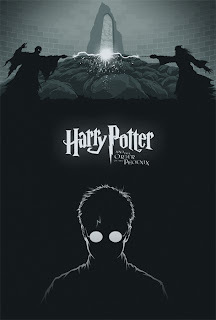 This is the fourth entry in my series of posters for the Harry Potter films and it's for the fifth film, Harry Potter and the Order of the Phoenix. Directed by David Yates, who went on to direct the rest of the films in the series, this film is the beginning of the build toward the battle for the wizarding world. Voldemort is back and once again building his army of followers. For the scene at the top of this poster, I wanted to feature the spectacularly staged duel between Voldemort and the only wizard that rivals him, Dumbledore. This also gave me an excuse to show the magma-esque "priori incantatem" - the phenomenon that happens when spells meet in duels in the HP universe. Looming over Voldemort and Dumbledore is the mysterious veil from the Death Chamber in the Department of Mysteries. 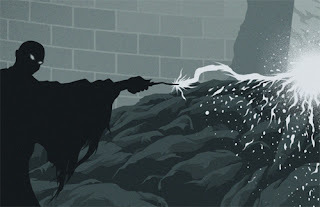 I felt this would be a foreboding presence in the image since it is where Harry loses the closest thing he has to family in the climax. That's four down and four to go. 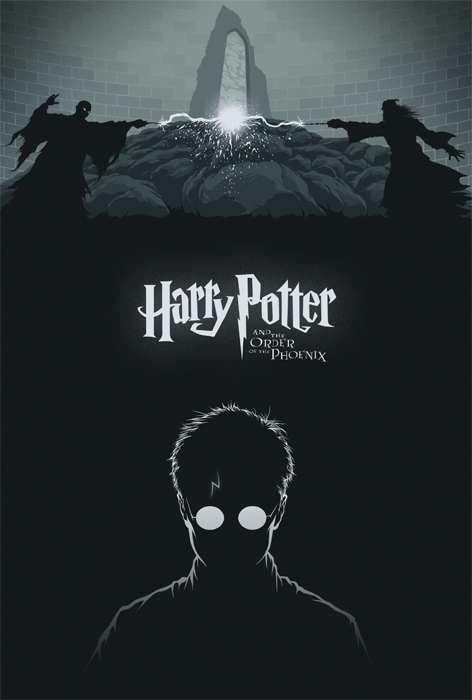 Next up is Harry Potter and the Half Blood Prince!